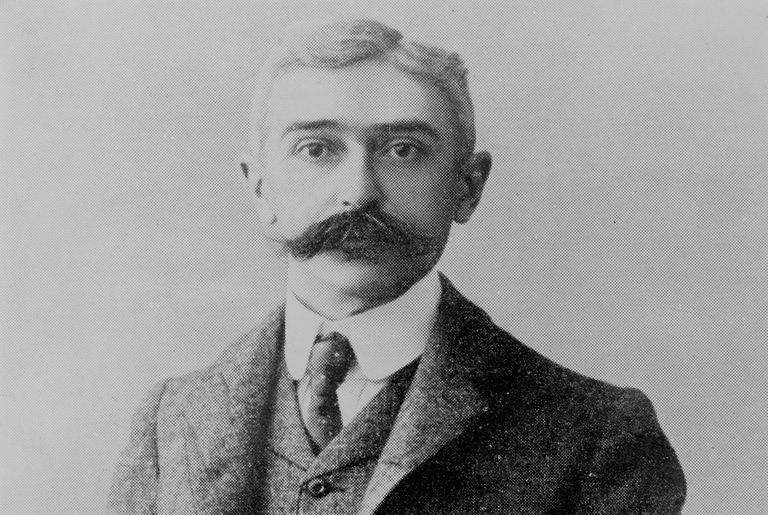 Pierre de Coubertin (January 1, 1863–September 2, 1937) was the founder of the modern Olympics. His campaign to promote athletic activities began as a lonely crusade, but it slowly gained support and he was able to organize the first modern Olympics in Athens in 1896. He was a founding member of the International Olympic Committee and served as its president from 1896 to 1925. Born on January 1, 1863, in Paris, Pierre Fredy, Baron de Coubertin was 8 years old when he witnessed the defeat of his homeland in the Franco-Prussian War. He came to believe that his nation’s lack of physical education for the masses contributed to the defeat at the hands of Prussians led by Otto von Bismarck. In his youth, Coubertin was also fond of reading British novels for boys that stressed the importance of physical strength. The idea formed in Coubertin’s mind early on that the French educational system was too intellectual. What was desperately needed in France, Coubertin believed, was a strong component of physical education. Athletics were becoming increasingly popular through the 1800s, after a long prior period when Coubertin's society was essentially indifferent to sports—or even considered sports to be a frivolous diversion. Scientists in the 19th century began touting athletics as a way of improving health. Organized athletic endeavors, such as baseball leagues in the United States, were celebrated. In France, the upper classes indulged in sports, and young Pierre de Coubertin participated in rowing, boxing, ​and fencing. Coubertin became fixated on physical education in the 1880s as he became convinced that athletic prowess could save his nation from military humiliation. In the 1880s and early 1890s, Coubertin made several trips to America and a dozen trips to England to study the administration of athletics. The French government was impressed with his work and commissioned him to hold "athletic congresses," which featured events such as horseback riding, fencing, and track and field. His object in coming to this country is to make himself thoroughly acquainted with the management of athletics at American colleges and thereby to devise some means of interesting the students at the French University in athletics. The ambitious plans of Coubertin to revitalize the educational system of France never really materialized, but his travels began to inspire him with a far more ambitious plan. He began thinking about having countries compete in athletic events based on the Olympic festivals of ancient Greece. In 1892, at a jubilee of the French Union of Athletic Sports Societies, Coubertin introduced the idea of a modern Olympics. His idea was fairly vague, and it seems that even Coubertin himself did not have a clear idea of the form such games would take. Two years later, Coubertin organized a meeting that brought together 79 delegates from 12 countries to discuss how to revive the Olympic Games. The meeting established the first International Olympic Committee. The committee decided on the basic framework of having the Games every four years, with the first one to take place in Greece. The decision to hold the first modern Olympics in Athens, at the site of the ancient Games, was symbolic. It also proved to be problematic, as Greece was embroiled in political turmoil. However, Coubertin visited Greece and became convinced the Greek people would be happy to host the Games. Funds were raised to mount the Games, and the first modern Olympics began in Athens on April 5, 1896. The festival continued for 10 days and included events such as foot races, lawn tennis, swimming, diving, fencing, bicycle races, rowing, and a yacht race. A dispatch in The New York Times on April 16, 1896, described the closing ceremonies the previous day under the headline, "Americans Won Most Crowns." The King [of Greece] handed to each winner of a first prize a wreath fashioned of wild olive plucked from the trees at Olympia, and laurel wreaths were given to the winners of second prizes. All of the prize winners then received diplomas and medals... .[T]he total number of athletes who received crowns was forty-four, of whom eleven were Americans, ten Greeks, seven Germans, five French, three English, two Hungarians, two Australians, two Austrians, one Dane and one Swiss. Subsequent Games held in Paris and St. Louis were overshadowed by World's Fairs, but the Stockholm Games in 1912 returned to the ideals expressed by Coubertin. During World War I, Coubertin's family suffered hardships and fled to Switzerland. He was involved in organizing the 1924 Olympics but retired after that. The final years of his life were greatly troubled, and he faced severe financial hardships. He died in Geneva on September 2, 1937. Baron de Coubertin gained recognition for his work promoting the Olympics. In 1910, former President Theodore Roosevelt, visiting France after a safari in Africa, made a point of visiting Coubertin, whom he admired for his love of athletics. His influence on the institution he founded endures. The idea of the Olympics as an event filled not merely with athletics but great pageantry came from Pierre de Coubertin. So while the Games are, of course, held on a scale far more grand than anything he could have imagined, the opening ceremonies, parades, and fireworks are very much ​a part of his legacy. Finally, it was also Coubertin who originated the idea that while the Olympics can instill national pride, the cooperation of the world's nations may promote peace and prevent conflict. “Americans Won Most Crowns: Olympian Games Closed with the Distribution of Wreaths and Medals.” New York Times, 16 April 1896, p. 1. archive.nytimes.com. de Coubertin, Pierre, and Norbert Müller. Olympism: Selected Writings. Comité International Olympique, 2000.